Last night, grassroots activists from around the world came together in a Paris city hall for Frontline Fightback: story sharing and movement building for those on the frontlines of the climate crisis. There were not enough chairs. We knelt on the floor and listened carefully. The room was filled with fighters: of trash incineration in Chile, of fracking in Northern Africa, of pipelines in Vermont. The energy of this diverse coalescence of humanity was electric. We talked strategy, and most every group reported back: this crisis demands direct action. Planning direct action here in the UN space is difficult. Actions not pre-approved by the UNFCCC Secretariat pose the risk of ‘de-badging’: being thrown out of the process entirely. At COP21 it has also been threatened, for the first time, that an entire organization can be de-badged should one individual choose to take unsanctioned action. The risk of losing the little say civil society has in the process has kept actions fairly tame until this point. With likely only two negotiating days remaining, things are beginning to heat up. 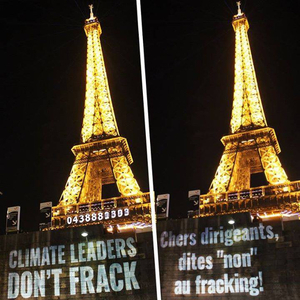 Wednesday saw a marked rejection of a key part of the mainstream narrative of COP21: the identification of politicians, CEOs and movie stars as ‘climate leaders.’ One of the false solutions promoted by so-called leaders over these past two weeks has been hydraulic fracturing or ‘fracking’ – a dangerous extraction method of natural gas that puts local communities at risk of groundwater contamination, earthquakes and numerous health hazards. While natural gas has been touted by the fossil fuel industry as a ‘low-carbon’ energy option, a number of high-profile studies have suggested very a very different conclusion. While anti-fracking movement leaders spoke up outside, just down the hall a very different group of supposed climate leaders had the floor. Governor Peter Shumlin of Vermont and Secretary Matt Rodriquez of the California Environmental Protection Agency were among the guests of Georgetown University, invited to speak on their leadership at the state level in the US. Both have refused to come out against proposed fossil fuel infrastructure. At Frontline Fightback, the night before, Shela Linton, a social justice organizer from Vermont spoke about the fracked gas pipeline she is currently fighting in Vermont: ‘I’ve been fighting a long time. The impact of this pipeline is on poor communities, on farmers, on the Abenaki people. I speak up for myself, for my children.’ Similar stories filled the room, all from people that have invested their time, energy and personal resources into travelling here to Paris to share their stories and build global solidarity for climate justice. The prospect of their fracking-friendly politicians flying in to be misrepresented as climate leaders was too difficult for some to bear. A young man at the back of the room stood up and began to sing: ‘We will realize we are of the Earth...’ As the audience turned to look, two others made their way quickly to the front and dropped a banner in front of Shumlin. I smiled at the image of the hypocritical governor with the truth spelled out in front of him: Fracked Gas = Climate Change. The moderator moved to quiet the crowd, while Shumlin attempted to ridicule the intervention: ‘How did you get here? On an airplane? That used fracked gas. You better find a way to swim home.’ I recoiled at his lack of understanding of the need for system change, at the lack of empathy for those who are suffering, at the naiveté of calling ‘hypocrite’ on an activist devoting their life to working towards climate justice. The interruptions continued, with other activists speaking out against fracking in California and a proposed oil terminal on the coast of Washington. Tensions continued to rise, climaxing with the impassioned and repeated interjections of Aly Johnson-Kurts, a young organizer from Vermont, who worked for the governor in 2008 at the state house. ‘Today I stand with young people and Vermonters opposed to fracking and fracked gas infrastructure,’ she yelled. ‘Vermont banned fracking in 2012 and in the announcement speech you cited risks to safe drinking water and health. In supporting this pipeline, you are simply putting those risks on other communities.’ The fracked gas to travel through the pipeline comes from First Nations land in Canada to the north. ‘Aly, I know your mom and dad,’ Shumlin derided her. ‘I know they taught you better manners than this. You’re missing classes back at college, go home.’ In one fell swoop, Shumlin demonstrated his ignorance of the magnitude of this moment. Young activists skipping school to be here at COP21 know exactly why they are here: there is no option to stand idly by as decisions are made about our collective future. Civil disobedience is necessarily uncomfortable. The conference currently underway here at COP21 is designed to silence the voices of the most vulnerable to climate change: those living on the frontlines of fossil fuel extraction and climate impacts. Today, a small group of climate leaders chose to step up their game, to bring their local struggles into this global conversation, to speak out and expose the blatant green-washing of this process. The criticisms of their action rang hollow. If not their governors, who? If not now, when? If not here, where? This is a pivotal moment, these are our leaders, these are our struggles right now. As we head into the final 48 hours of negotiations here in Paris, tensions are running higher than ever. It is increasingly evident that the agreement on the table is unjust at best, and fatal at worst. It is our responsibility to speak up as loudly as we can.